For a long time the parish priest of Moncada in Spain had celebrated Mass without any scruples of conscience, when suddenly he became the prey of a violent doubt as to whether he had been rightly ordained. In his distress, to allay his doubts he determined to put his case before his bishop. He immediately set out on foot and journeyed to Valencia, the seat of the diocese. In this place it pleased Almighty God to deliver him from his trouble, and to give him light and peace by means of a very remarkable miracle. In Valpariso, Chile, at the beginning of the 20th century, Fr. Mateo Crawley-Boevey SS, CC., well known as the great Apostle of the Sacred Heart of Jesus, was a young priest. Fr. Mateo told this story wherever he preached and he found that where people were prepared to earn "three golden coins" with love, many graces were obtained and many conversions followed. Some years ago, a young man was unhappily led astray into the paths of Jewish infidelity. While still in the flower of youth, his heart was filled with dreams of glory to be attained as a distinguished musician. One evening he was asked to play the organ in one of the principal churches in Paris; there in that church God awaited him, and prepared for him, not a triumph of his self-love, but a humiliation a thousand times more glorious. Already the roof of the sacred edifice re-echoed the sound of the solemn chants, and the melodious tones of the organ had filled all hearts with recollection and prayer; every head was bowed and the God of the Eucharist had blessed His children prostrate in lowly adoration. The unbelieving musician, alone, dared to raise his haughty brow before that God despised by his forefathers, but in vain. A mysterious and invisible hand bowed his head and humbled him to the ground. A miracle of grace was effected; the young man was conquered; he knelt down a Jew; he rose up a Catholic. His heart wounded by the Real Presence in the Sacred Host, he left the church; soon the waters of Baptism were poured upon him, and exchanging his fashionable attire for the coarse serge of a monk, he bade an eternal farewell to the pleasures of the world. A living example of the power of the Sacred Heart of Jesus in the Blessed Sacrament, he went from city to city, and from village to village, proclaiming the love of God, repeating again and again: "The days of grief are departed. 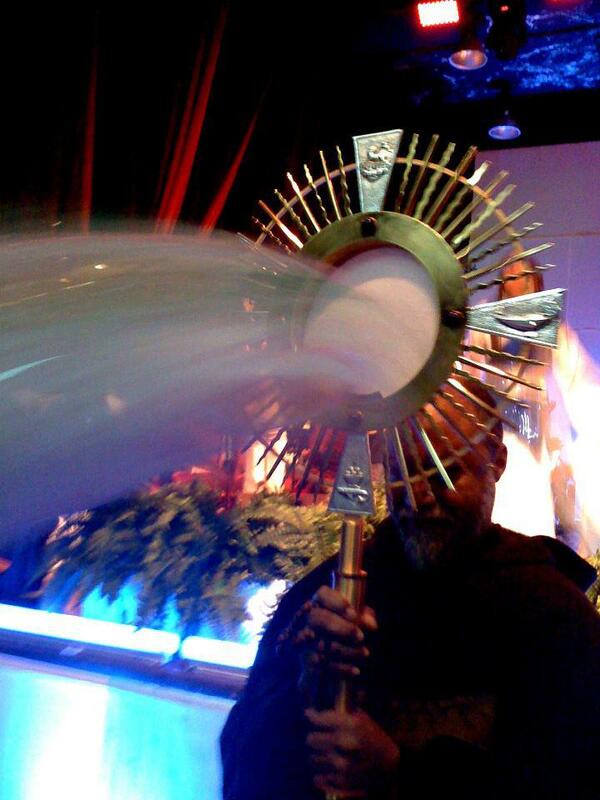 I have found peace of heart since I have tasted the delights of the tabernacle of the Lord." If you would know the name of this privileged soul, ask it at the cloister of Mount Carmel, and they will tell you it was Father Augustine of the Most Blessed Sacrament. If one single visit to the God of the Eucharist transformed an obstinate Jew into a good Catholic, what may we not hope to obtain by devout visits to the Blessed Sacrament? About the year 1599, in the city of Posen, a very remarkable incident took place in connection with the Blessed Sacrament. A servant girl, who was bribed by some unbelievers, stole from the chapel of the Dominicans three small Hosts, wrapped them in a linen cloth, and carried them to the house of the wretches who had hired her for the deed. The unbelievers treated the Sacred Hosts in a most sacrilegious and shameful manner. They threw them on a table and cut the Sacred Particles. Blood spurted out on the first one of the sacrilegious creatures and left a stain that could not be removed. The report of this strange occurrence soon spread abroad and crowds ran to see for themselves. A blind woman insisted on being led to the scene of this marvelous incident. Divinely inspired, she cried out: "If Thou art the true God, He whom our ancestors nailed to the Cross, restore to me my sight!" She was immediately cured, and went away proclaiming the miracle. The guilty profaners, fearing the just punishment of their heinous crime, wished to dispose of the desecrated Hosts, and after several fruitless efforts buried them to a great depth in a swamp. In the meantime, the father returned from Mass. As soon as the boy saw him he ran to meet him. "Father," he shouted, "our oxen are adoring the Blessed Sacrament!" "Nonsense!" replied the parent, shrugging his shoulders, "what folly is this!" "Come and see for yourself," protested the boy, "that I am telling the truth." While proceeding on his way the old man suddenly paused, with feet fastened to the ground and with eyes entranced as he beheld the astonishing scene. There at the farthest end of the marsh three little lights hung in the air, while the dumb beasts knelt with heads bowed to the earth. The old herdsman, all doubts gone, knelt in adoration before the three consecrated Hosts profaned by the unbelievers. After a moment's prayer, the old man ran to the city and proclaimed the wonder to all whom he met. The people, however, looked upon him as a fool, and even cast him into prison. And now a new wonder occurred–the prison door opened and freed the prisoner. This startled the authorities and they began to investigate. The Bishop and the clergy were informed and went in procession to the place indicated by the herdsman. Then the Sacred Hosts, which had remained suspended in the air, slowly descended and rested in the hands of a saintly priest. They were taken back to the city amidst great pomp and splendor. Then the authorities began to debate what disposition to make of the miraculous Hosts. While they were arguing, the Hosts rose from their hands, ascended into the air and returned to the marsh. The wish of Our Lord was evident. So they erected an improvised sanctuary on the spot, and this in turn was soon followed by a magnificent basilica founded by Ladislaus Jagellon, King of Poland. Needless to say, thousands of pilgrims have visited the famous shrine to adore the miraculous Hosts.